Tough as it is to believe Carla Bley is now 80 years old, it’s not hard at all to hear that her questing spirit is undiminished on this album of new work. 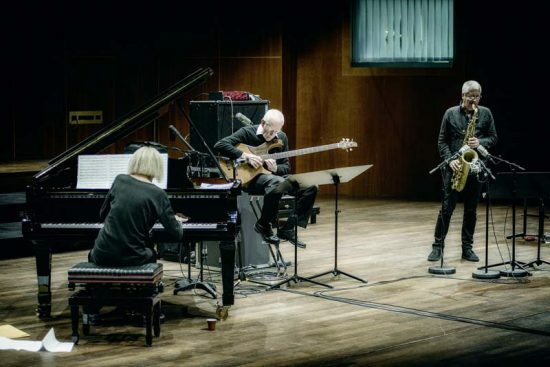 With saxophonist Andy Sheppard and bassist Steve Swallow-her go-to musical partners of 20 years-by her side, Bley continues to navigate through knotty chord structures, explore the elasticity of time and tease out the nuances of her own compositions, which seem at first to be pure products of the cerebrum but soon reveal a tremendous depth of feeling. You can pick that up in “Saints Alive!,” as Swallow lingers in his upper register for a haunting five-minute statement and Sheppard responds with a solo that’s so film-noir you can almost see the rain glistening on the nocturnal city streets. Bley’s thoughtful piano comping during “Naked Bridges/Diving Brides” is similarly evocative, a jigsaw puzzle of distant memories, with each keystroke offering another piece. The main event here, however, is the 28-minute title suite, which Bley describes in the liner notes as representing three stages of recovery from addiction. Its central conceits, appearing and reappearing in various guises throughout the suite’s three parts, are a simple ascending line and a tango-like rhythm. But what layers of complexity arise from those basic ingredients! And what emotions too: anguish in the first section (brought home by Sheppard’s pensive tenor), tenderness in the second and determination in the third, which speeds up the original theme, turns it upside down and splinters it into tiny fragments that the three players then trade among themselves in humorous round-robin fashion.